Excellent reviews from satisfied clients have earned Amerihope Alliance Legal Services two more prestigious awards. Based in Plantation, Florida, the firm's practice is focused on helping homeowners in Florida, New York, New Jersey, Illinois, and Pennsylvania with foreclosure defense and loan modifications. This year's award makes four consecutive years – 2013, 2014, 2015 and 2016 – of receiving Client Distinction awards from Martindale-Hubbell, which has been considered the gold standard for rating attorneys for more than a century. Amerihope Alliance Legal Services receives fourth Client Distinction Award from Martindale-Hubbell and third Top Lawyers in Florida award based on outstanding reviews from satisfied clients. 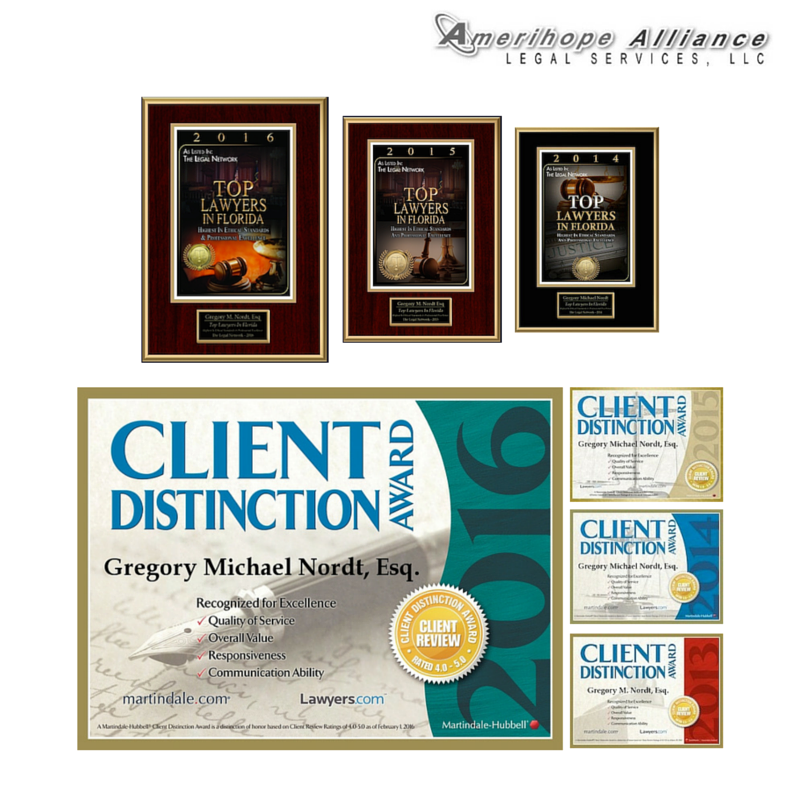 Gregory M. Nordt, Esq., attorney, managing partner, and founder of Amerihope Alliance Legal Services, was again awarded the Client Distinction Award for 2016 based on excellent reviews from clients in the areas of communication ability, responsiveness, quality of service, and value of money. This year's award makes four consecutive years – 2013, 2014, 2015 and 2016 – of receiving Client Distinction awards from Martindale-Hubbell, which has been considered the gold standard for rating attorneys for more than a century. When Amerihope Alliance Legal Services opened in 2008, attorney Gregory Nordt had a mission, which was to provide foreclosure defense through having the most efficient home retention team possible. Nordt hired a team of experienced underwriters, which he calls “loan modification wizards,” and together they became a powerhouse at obtaining loan modifications for his foreclosure defense clients. How did he differ from almost every other foreclosure defense attorney? He has made a lot less money. His success is in obtaining loan modifications with his staff of underwriters. He had the same overhead in operating a law firm and defending homeowners in foreclosure as other attorneys but with the added expense of a processing team. Since 2008, most attorneys that focused on foreclosure lawsuits have moved on to other more lucrative areas of the law. In 2016, Amerihope Alliance Legal Services’ primary law practice is still foreclosure with ninety-five percent of its clients seeking foreclosure defense. Amerihope Alliance Legal Services has a record of success in helping distressed homeowners avoid foreclosure by providing the ancillary service of loan modification negotiation. Some law firms do offer foreclosure defense services in addition to bankruptcy, divorce, criminal defense, and other legal services, but Nordt feels offering so many services can prevent a firm from gaining the requisite experience in any one field. Nordt was also awarded his third Top Lawyers in Florida award from the Legal Network. “I am humbled by this recognition and am proud of my firm and my staff. In this technological world, reviews speak volumes and I am thankful that our clients take their time to review our legal services and recognize our extra efforts on their behalf,” said Nordt. The two awards the firm has received are the most recent in a long line of accomplishments and recognitions. Other recent awards the firm has received include the Spectrum Award for excellence in customer satisfaction from City Beat News in 2015. Also in, 2015 Martindale-Hubbell recognized Gregory M. Nordt for his 20th anniversary of proudly serving the community. Since 2008, Amerihope Alliance Legal Services has remained dedicated to its core focus, helping an average of 1,000 clients a year successfully modify their mortgage loan and remain homeowners. To date, they have helped more than 7,000 homeowners achieve their goals. Over a million American homeowners are still in need of help with their housing-related issues. Six million homeowners have already lost their homes to foreclosure and another million are currently in foreclosure. As many as 40% of homeowners either have negative equity in their home or low equity. The federal government's Home Affordable Modification Program (HAMP) gives incentives to mortgage loan servicers to modify loans for borrowers in default that lower their payment and allow them to avoid foreclosure. HAMP has not been an unqualified success or helped as many homeowners as it was intended to. But it has helped some and also served as a template for banks to develop their own in-house modification programs. Borrowers interested in obtaining a HAMP modification are encouraged to act as soon as possible because the program is set to expire December 31, 2016.